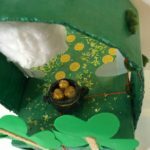 My son had to make a leprechaun trap for his school project. After googling a bit, we came up with an idea to make it using the concept of simple machine , the pulley. It was pretty simple to make and easy to handle and demonstrate. My son was so happy with the finished project. Using the clay, make a cauldron and some small flat circles to look like coin. Let them dry and later paint the cauldron black and the coins golden in color. 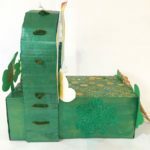 From the lid of the shoebox, cut a broad strip of cardboard lengthwise to form the arch. We would be attaching the pulley and colored rainbow sheet on it. Paint the shoe box and arch metallic green. While the paint is still wet, sprinkle some golden glitter and let it dry. Attach the arch to the sides of the shoebox using a pipe cleaner by making a hole with a scissor or knife. Once the arch is properly secured, create two holes vertically in the center of the arch where the pulley would be fixed. Thread the pulley through a pipe cleaner and secure it on the center top. 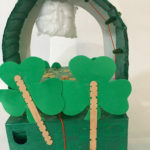 Similarly create some holes on one side of the arch and create a hook using pipe cleaners. Glue cotton on the plastic cup and make a small hole in the center of the bottom of the cup. This would like a cloud hanging in the sky. Tie a metal washer to one side of the thread and loop the other thread through the plastic cup. 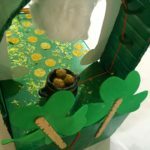 ( We would tie the metal washer on one end of the thread to create weight, so that when the leprechaun picks up the cauldron, the plastic cup in the form of cloud falls down quickly). Loop the thread through all the hooks created along the arch and place the cauldron on top the the thread. This would keep the cloud hanging up in place. Decorate it by drawing a cloud and a rainbow on the white cardstock and gluing it on the arch. This would also hide the trap behind the rainbow. Finally, lay two chopsticks side by side at a distance and glue the toothpicks on them to look like a ladder. Once dry , paint them golden. 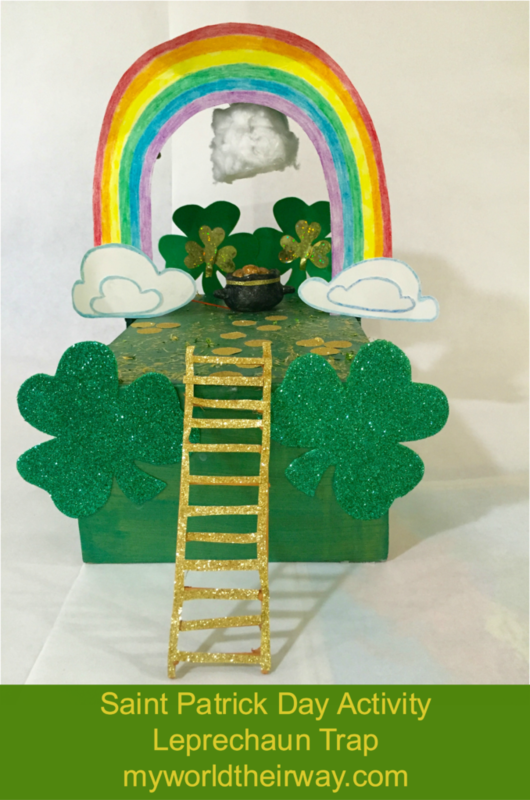 A beautiful model of working leprechaun trap is ready.